This paper addresses the impact of a political and cultural frontier on the institutional identity of Furness Abbey, in the twelfth century. This ‘frontier’ is defined as the series of geographical, political and cultural boundaries across the Irish Sea, which divided England, Scotland, Ireland and the Isle of Man. Making use of the Furness Coucher Book, a cartulary compiled at the Abbey in c. 1412 and containing material from earlier periods, this paper discusses the place of Furness Abbey within this frontier, from its foundation in 1127 to its expansion within the Furness peninsula, c. 1150. Of primary interest is how far the circumstances of the frontier influenced the identity of Furness Abbey, and if the Abbey should be described as a frontier monastic institution. Christopher is a first-year PhD Medieval History student at Lancaster University supervised by Dr Fiona Edmonds. Furness Abbey, located on the Furness peninsula in the north-western extremity of England, has often been viewed as remote and removed, ideal for pursuing the contemplative monastic life. These feelings of separateness are encapsulated in a parliamentary petition contained within the Furness Coucher Book, the fifteenth-century cartulary of the Abbey, protesting at the inability of the Abbot to attend wapentake courts in the West Riding of Yorkshire. Here, Furness is referred to as ‘une isle en la counte de Lancastre’ (an island in the County of Lancaster), surrounded by ‘deux perilous braces du mere’ (two perilous stretches of sea), now known as Morecambe Bay. However, the Abbey’s isolation should not be overstated. Rather, following its establishment in 1127, the Abbey spent much of the twelfth century searching for an institutional identity built on relationships with others. Whilst originally focused on its connection with King Stephen I, as his interest started to wane the Abbey came to define itself through engagement with a wider Insular frontier. At the same time it introduced Continental, political and ecclesiastical developments onto this frontier. Furness Abbey should be seen as eventually coming to represent, as well as to shape, the Insular frontier, carving out its own domain which it would eventually seek to associate with the monastery itself. This article will explore whether Furness Abbey can be described as a frontier monastic institution. The term, ‘frontier monastic institution’, will be defined here as a monastic institution situated between different and distinguished political and cultural zones, as well as actively influenced by and defining itself in accordance with the prevailing historical trends of these zones. This is based upon Emilia Jamroziak’s claim that frontier monasticism was, in essence, part of the process which brought the frontiers of Latin Christendom into the ‘mainstream’ of Western Europe. I shall confine this investigation to the period between the foundation of the Abbey in 1127 and c.1150, often seen as representing the period of monastic expansion in the High Middle Ages. The Insular frontier will be defined for the purposes of this article as the series of geographical, political and cultural boundaries across the Irish Sea zone between England, Scotland, Ireland and the Isle of Man up to c.1150. This article will contribute towards newly emerging scholarship on Furness which portrays the area as part of a wider frontier zone, as was advanced in the 2011 Jocelin of Furness conference. Central to this scholarship, and this article, is how developments upon that frontier tangibly affected the identity and evolution of Furness Abbey. Fig. 1. 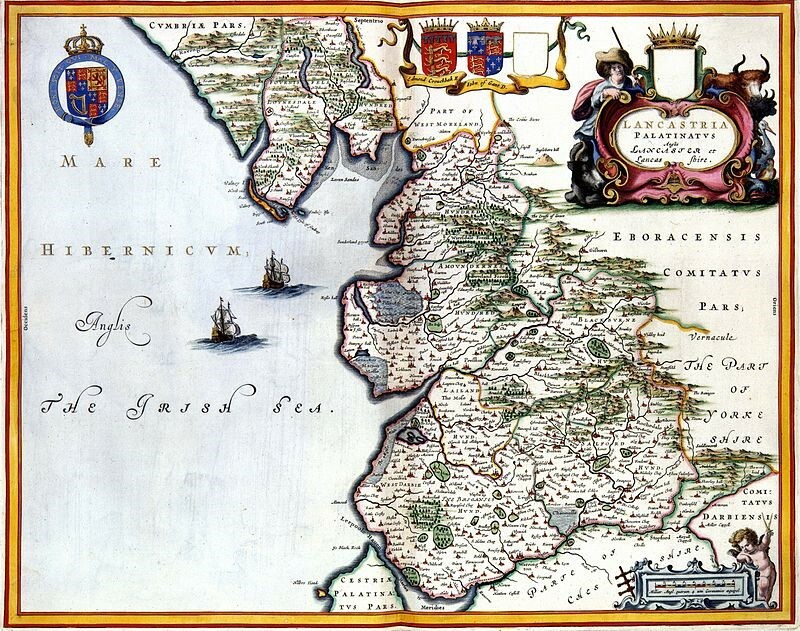 Map of Lancashire by John Blaeu (1645), showing the Furness Peninsula situated due west of Lancaster, due south of what is referred to here as the ‘Fournes Fells’, and due east of the ‘Mare Hibernicum’ (The Irish Sea). Accessed via Wikimedia Commons. Furness Abbey was founded in 1127 as the first daughter-house of the Congregation of Savigny in England by Stephen, Count of Boulogne & Mortain, later Stephen I of England (1135-1154). Savigny was founded by Vital of Mortain (c.1060-1122) as a reformed monastery within the County of Mortain, near the Forest of Craon on the border between Normandy and Brittany, which at that time was a centre for experiments in monastic reform. The mother-house of Furness Abbey already had credentials as a frontier monastic institution within the political and ecclesiastical context of Normandy, and required consistent patronage from the Count of Mortain in order to maintain its foothold on the Norman-Breton border. The prevailing trend in twelfth-century monastic reform, exemplified by the Cistercian Order, was characterised by numerous experiments in attempting to renew the original spirit of Benedictine monasticism and the organisation of monastic administration through centralised frameworks that eventually became the hallmark of a reformed monastic Order. Savigny could be seen as part of this trend: a reforming monastery expanding the borders of Latin Christendom in the manner of the Cistercian Order, with whom the Congregation eventually became affiliated with by 1147. During this period, Archbishop Thurstan of York (1114-1140) was particularly keen on promoting monastic reform within the North of England, and was likely an active component in this process of monastic expansion upon the Insular frontier. His political motivations for backing the Savigniac presence in Furness seemed linked to his designs for implementing ecclesiastical reform in partnership with King Olaf I of Man (d.1153), as well as a desire to head off competition from the Bishopric of Glasgow for claims to episcopal authority within the North West of England. For Count Stephen, who had been granted the County of Mortain for his service to Henry I of England (1100-1135), it was arguably a combination of pressure to maintain the spiritual and secular connection between the County of Mortain and a political imperative to remain within the good graces of Henry I which spurred him towards expanding the Congregation of Savigny into his English territories. In addition to becoming Count of Mortain, Stephen had been granted the Honour of Lancaster in 1120, a political entity stretching from the River Mersey to the Furness peninsula. This had been confiscated from its previous lord, Count Roger of Poitou, in 1102 following his involvement in the 1101 rebellion against Henry I. The Honour had been created in 1092 to consolidate Norman political control over the North West of England, which began in earnest after the fall of Carlisle to William II Rufus (1086-1100) in that year. It has been argued that the Honour of Lancaster was a ‘military salient’, representing the extension of English royal authority to the North West of England. The Honour of Lancaster could itself be conceived as a “frontier” political entity, intended to define a previously ill-defined area within the Kingdom of England and to respond to developments from competing entities with designs upon the Insular frontier. Chief among them in the late-eleventh century was Malcolm III of Scotland (1058-1093), who had previously exercised authority over the area encompassing the modern county of Cumbria, claiming it as part of the Kingdom of Cumbria-Strathclyde. The area of Furness initially assigned to Furness Abbey by Count Stephen closely reflected his inheritance of the Manor of Hougun within the Furness domains that became incorporated into the Honour of Lancaster. Hougun, owned by Earl Tostig Godwinsson before 1066, has traditionally been identified with Millom, but other scholars prefer to locate it on the Furness peninsula itself, at High Haume. This pre-Conquest settlement initially represented Anglo-Saxon governmental interaction with the cultural dynamics of the Insular frontier, but it had now evolved into an instrument for imposing Anglo-Norman authority upon Furness by Count Stephen. The lands of Michael le Fleming, Lord of Aldingham, were specifically excluded from the Foundation Charter of Furness Abbey, with the boundaries of the Abbey’s domain according with those of the Manor of Hougun attested to in the pre-Conquest geld list. The foundation of Furness Abbey in 1127, therefore, played an important part in incorporating the peninsula further within the administrative infrastructure of the Honour of Lancaster, while acknowledging existing patterns of land tenure that reflected the ethnic diversity of the Insular frontier. Evidence of the pre-existing cultural diversity of the Insular frontier is illustrated by current place-names within Furness. Roose and Walton appear to incorporate elements of Brittonic etymology, and it is at least conceivable that they may have originated long before the coming of the Abbey to the peninsula.As well as Brittonic, Gaelic-Scandinavian influences can similarly be detected in other place name and personal name evidence within Furness, especially in the pre-Conquest geld list which informed the Domesday Survey of 1086. For example, Gaelic names such as Duvan and Gille Michel, and Scandinavian names such as Thorulf and Ulf, are recorded as landowners. The Gaelic-Scandinavian place name of Kirksanton also reflects long-standing links between Furness (in this case around the Millom area) and the Isle of Man, complemented by the similarity of eleventh-century material culture found both at Millom and on the Isle. From the outset therefore, Count Stephen inherited a political environment for the Furness peninsula which acknowledged prevailing patterns of distribution of authority upon an ethnically heterogeneous frontier. From its beginnings as a “reformed” monastic institution, and the conscious definition of Furness Abbey against the context of the Insular frontier in which it was based, the Abbey scrupulously attached its sense of institutional identity to the patronage of Count Stephen. This is shown by the association of the Abbey with the royal munificence inherent throughout the Foundation Charter, as the pro anima bequest recalls not just his own soul and that of his wife, Countess Matilda of Boulogne (1125-1152), being the subject of intercession for salvation, but that of his uncle Henry I. It has been suggested that Furness Abbey was established with the intention of being at the forefront of monastic trends in twelfth-century English monasticism and to maintain a continuing connection to the Anglo-Norman world within the context of the Insular frontier. This would help bring Continental monastic reform to the Insular frontier, while maintaining its direct connection with the County of Mortain as a daughter-house of Savigny, which Count Stephen especially desired for the new monastery. The initial reluctance of aristocratic benefactors in Furness to donate land to the Abbey, however, suggests that it was viewed by contemporaries as an unwelcome imposition at odds with the established political and cultural connections of Furness to the Insular frontier. Furthermore, there are few indicators that even the founding Furness benefactors were consulted by Count Stephen regarding its foundation. Furness aristocrats such as the Penningtons and Kirkbys were aware of wider European ecclesiastical developments in the twelfth century, yet they invested more of their spiritual and material resources in rebuilding and reforming their own parish churches than acting as benefactors to the new monastery. However, aristocratic benefaction did eventually come to Furness Abbey. One example of this can be seen in the earliest grant from the Penningtons to Furness Abbey in c.1154, of Skeldhou Moor, which was not made directly to Furness Abbey but to its daughter-house on the Isle of Man, Rushen Abbey. The indirect benefaction to Furness via Rushen Abbey could have been made because the Penningtons, in a similar way to other contemporary benefactors, came to view Furness Abbey as one political actor among many within the Insular frontier. Within Furness itself, compromise with local benefactors can also be observed by the mid-twelfth century, as demonstrated by the final resolution between Furness Abbey and Michael le Fleming concerning a shared boundary between their lands. The deal was sealed with a mutual exchange of Roose and Crivelton, delineating the boundary between the two manors from Roose to Rampside, for Bardsea and Urswick in c.1153, which was perhaps intended to respect the original manorial boundaries concerning the Manor of Hougun and Muchland as outlined in the Domesday Survey. Despite his centrality during the foundation process, and consequently his place in the institutional memory of Furness Abbey, Count Stephen soon divulged himself from active intervention in the Abbey’s affairs, especially after becoming King Stephen of England in 1135. He also left unresolved the ambiguity over the precise territorial delineations within Furness which the monks encountered upon arriving in the peninsula. Furness Abbey therefore needed to act as if it were a frontier monastic institution, recognising and integrating itself into the local power networks within its part of the Insular frontier in order to assert its political position. Ownership of the church of Urswick provided another point of contact reflecting the frontier character of the Furness peninsula. Urswick had originally been settled by a diverse population from across the Insular frontier, incorporating Anglo-Scandinavian and Gaelic artistic styles into its material culture. This is represented on the ninth-century cross fragment in Great Urswick church, with a ring-head inspired by sculpture from the Gaelic-speaking world and an Anglian runic inscription in Old English verse by Tunwini in memory of his son Torhtred. According to the c.1153 settlement between Furness Abbey and Michael le Fleming that was confirmed by his son William le Fleming, the vill of Urswick was to remain within Muchland, but the church of Urswick would be possessed by the Abbey. This proved of great significance to Furness Abbey, not only in resolving the issue of its territorial boundaries within Furness, but also in articulating a claim to be the spiritual guardian of the legacy of missionary endeavours from across the Insular frontier, and as a patron of the multi-ethnic inhabitants of that frontier. Fig. 2. Map showing the establishment of Furness Abbey within the context of monastic foundations in the British Isles by c. 1200. 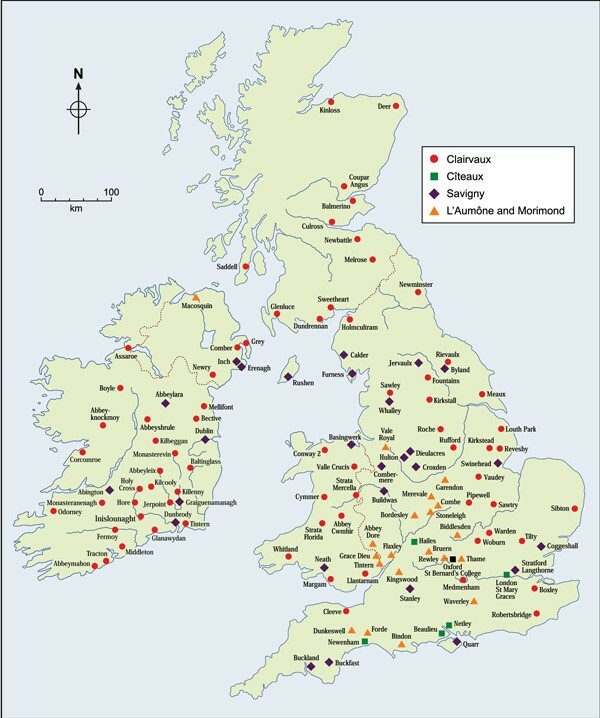 (Source: Map of the Cistercian houses in Britain and Ireland, in The Cistercians in Yorkshire). As Furness Abbey expanded its influence beyond Furness in the early-twelfth century, it established daughter-houses across the Insular frontier. One of its earliest daughter-houses was Rushen Abbey on the Isle of Man in 1134. Founded by King Olaf I of Man, it was conceived with Archbishop Thurstan of York as part of the programme of ecclesiastical reform to extend the authority of York over the Isles, and for Olaf I to strengthen his political legitimacy and reforming credentials by integrating himself further into the court of Henry I. As part of this arrangement, the Abbot of Furness gained the right to appoint the Bishop of Man via its daughter-house at Rushen. Thus, Furness Abbey was now acting as a conduit through which critical actors could be channelled to bring continental influences to bear upon the Insular frontier. As its influence grew, Furness Abbey assumed a major role in establishing daughter-houses in Ireland, especially Inch Abbey, and its associations with the colonial ambitions of John de Courcy (1150-1219). Establishment of daughter-houses such as Inch demonstrated the readiness of Furness Abbey to appropriate the Gaelic influences of the Insular frontier for the purpose of monastic reform. Sensitivity to Gaelic culture, however, defined how Furness Abbey related to its daughter-houses. This is shown by the chronicler Jocelin of Furness, based at Furness Abbey, who wrote his Life of St. Patrick, illustrating his familiarity with the Gaelic language and many aspects of Gaelic culture. While praising John de Courcy as bringing civilisation to the Irish, his Life of St Patrick remained sensitive to the pre-existing Irish hagiography produced on St. Patrick and adapted it within the context of twelfth-century European church reform. As Furness Abbey was forced to come to terms with membership of the Cistercian Order after 1147, it appears to be that, if the Abbey was to sustain its presence upon the Insular frontier, it had to define part of that frontier as coterminous with the monastic institution, creating an institutional “memory” of Furness as an “island” that endured into the fifteenth-century written record. Furness Abbey seemed to have the intention of making its new Cistercian identity work for its own ends in advancing its position on this Insular horizon of Latin Christendom throughout the twelfth century, as well as shaping its own place on that frontier for centuries to come. In conclusion, it would appear that, at least according to Emilia Jamroziak’s definition, Furness Abbey can be defined as a frontier monastic institution by c.1150, introducing Continental political and ecclesiastical developments upon the Insular frontier whilst compromising with the existing cultural influences of that frontier. From its beginnings as a reformed continental institution dependent upon the patronage of the scions of English royalty, Furness Abbey during the early-twelfth century evolved to reconcile its position upon the Insular frontier with being an institution that could represent and shape that frontier through active engagement in its twelfth-century developments. Furness was never integrated into one particular sphere, but instead found its place upon its own part of the Insular frontier, from which it could engage with multiple groups and contacts. C. Dade-Robertson, Furness Abbey: Romance, Scholarship and Culture (Lancaster, 2000), pp.13-17; on how the isolated ruin of Furness Abbey inspired the Romantic and Picturesque movements to depict the Abbey, see pp.30-32; on the ‘mystical sense of solitude’ imagined by Wordsworth in the context of natural decay of the ruins, see p. 31. J. Stell, The Furness Abbey Coucher Book, J. Brownbill (ed.& trans. ), 3 vols. (Manchester, 1915-1919), vol.2, p.472. F. Edmonds, ‘The Furness Peninsula and the Irish Sea Region: Cultural Interaction from the Seventh Century to the Twelfth’, in C. Downham (ed. ), Jocelin of Furness: Essays from the 2011 Conference (Donington, 2013), pp.18-19. D. Abulafia, ‘Introduction: Seven Types of Ambiguity, c.1100-c.1500’, in D. Abulafia & N. Berend (eds. ), Medieval Frontiers: Concepts and Practices (Aldershot, 2002), p.17; J. Burton, ‘Dioceses, Saints’ Cults and Monasteries’, in K.J. Stringer & A.J.L. Winchester (eds. ), Northern England and Southern Scotland in the Central Middle Ages (Woodbridge, 2017), pp. 194-195. E. Jamroziak, Survival and Success on Medieval Borders: Cistercian Houses in Medieval Scotland and Pomerania from the Twelfth to the Late Fourteenth Century (Turnhout, 2011), pp. 198-199. R.I. Burns, ‘The Significance of the Frontier in the Middle Ages’, in R. Bartlett & A. Mackay (eds. ), Medieval Frontier Societies (Oxford, 1989), pp. 313-314: A. Lewis, ‘The Closing of the Medieval Frontier, 1250-1350’ in Speculum, 33 (1958), p. 475: R. Bartlett, The Making of Europe: Conquest, Colonization and Cultural Change, 950-1350 (London, 1993), pp. 256-260. See especially Edmonds, ‘The Furness Peninsula’, pp.17-44: J. Burton, ‘Furness, Savigny and the Cistercian World’, in C. Downham (ed. ), Jocelin of Furness: Essays from the 2011 Conference (Donington, 2013), pp. 7-16: M.-T. Flanagan, ‘Jocelin of Furness and the Cult of St. Patrick in Twelfth-Century Ulster’, in C. Downham (ed. ), Jocelin of Furness: Essays from the 2011 Conference (Donington, 2013), pp. 45-46. Burton, ‘Furness, Savigny and the Cistercian World’, p.8: B. Poullé, ‘Savigny and England’, in D. Bates & A. Curry (eds. ), England and Normandy in the Middle Ages (London, 1994), pp. 159-168. J. Burton & J. Kerr, The Cistercians in the Middle Ages (Woodbridge, 2011), pp.4-7: D. Knowles, The Monastic Order in England, (Cambridge, 2nd Ed., 1963), pp. 200-202. Burton, ‘Furness, Savigny and the Cistercian World’, pp. 7-9. Burton, ‘Furness, Savigny and the Cistercian World’, pp. 8-10. Poullé, ‘Savigny and England’pp.159-166; W. E. Kapelle, The Norman Conquest of the North: The Region and its Transformation, 1000-1135 (London, 1979), p. 200. R.H.C. Davis, King Stephen, 1135-1154 (London, 1967), p. 8. W. Farrer & J. Brownbill (eds. ), ‘Houses of Cistercian monks’, <http://www.british-history.ac.uk/report.aspx?compid=38348>, accessed 27/03/2018. Kapelle, The Norman Conquest of the North, p. 145. F. Edmonds, ‘The Emergence and Transformation of Medieval Cumbria’, in The Scottish Historical Review, 93 (2014), pp. 210-211: J.G. Scott, ‘The Partition of a Kingdom: Strathclyde, 1092-1153’, in Transactions of the Dumfriesshire and Galloway Natural History and Antiquarian Society, 72 (1997), pp. 15-18. W. Farrer & J. Brownbill (eds. ), The Victoria History of the County of Lancaster, Vol. I (London, 1906), p. 289, cited in Edmonds, ‘The Furness Peninsula and the Irish Sea Region’, p. 32; F. Barnes, Barrow and District (Barrow-in-Furness: Barrow-in-Furness Corporation, 1968), pp. 19-21. Edmonds, ‘The Furness Peninsula and the Irish Sea Region’, p. 32. J. Stell, The Furness Abbey Coucher Book, J. C. Atkinson & J. Brownbill (eds.& trans. ), 3 vols. (Manchester, 1886-1887), vol.1, p. 123: Lewis, ‘An Introduction to the Lancashire Domesday’, cited in Edmonds, ‘The Furness Peninsula and the Irish Sea Region’, , p. 32; Barnes, Barrow and District, pp. 18-19, 22-23; Edmonds, ‘The Furness Peninsula and the Irish Sea Region’, , p.36. Barnes, Barrow and District, p.13. Edmonds, ‘The Furness Penininsula and the Irish Sea Region’, p. 34. J.Stell, The Furness Abbey Coucher Book, vol.1, pp. 122-123. C. Downham, ‘Introduction’, in Downham (ed. ), Jocelin of Furness, 1; Edmonds, ‘The Furness Peninsula and the Irish Sea Region’, , pp. 42-44. Burton, ‘Furness, Savigny and the Cistercian World’p. 9. P. Latimer, ‘Assimilation in North-Western England from the Norman Conquest to the Early Thirteenth Century: The Kirkby, Pennington and Copeland Families’, in Northern History, 47 (2010), pp. 63-64. Latimer, ‘Assimilation in North-Western England’, p.63; In the case of the Penningtons, the earliest known ancestor of the family, Gamel of Pennington, rebuilt the church at Pennington in Romanesque style, dedicating their investment in a Norse runic inscription in the tympanum of the church. The tympanum is possibly unique within this Insular context, and could illustrate awareness by Gamel de Pennington of his Anglo-Norse heritage as well as embracing new trends in church architecture. The tympanum and its significance are discussed in Barnes, Barrow and District, pp. 16-17: A. Fell, A Furness Manor: Pennington and its Church (Ulverston, 1929), pp. 71-72; Latimer, ‘Assimilation in North-Western England’, p. 63. J.Stell, The Furness Abbey Coucher Book, vol.2, p. 510. B. Hudson, Viking Pirates and Christian Princes: Dynasty, Religion, and Empire in the North Atlantic (Oxford, 2005), p. 9. Burton, ‘Furness, Savigny and the Cistercian World’, pp. 9-10. H. Birkett, The Saints’ Lives of Jocelin of Furness: Hagiography, Paronage and Ecclesiastical Politics (Woodbridge, 2010), p. 167: Charter of assent to the election by Furness Abbey of Nicholas, Abbot of Rushen, to be Bishop of Man (1203-1213), DL 25/545, Duchy of Lancaster Deeds, National Archives (NA). Flanagan, ‘Jocelin of Furness and the Cult of St. Patrick in Twelfth-Century Ulster’, in Downham (ed. ), Jocelin of Furness, pp. 46-48: S. Duffy, ‘The First Ulster Plantation: John de Courcy and the Men of Cumbria’, in T.B. Barry, R. Frame & K. Simms (eds. ), Colony and Frontier in Medieval Ireland: Essays Presented to J.F. Lydon (London, 1995), pp. 8-9. F. Edmonds, ‘Furness Abbey and Daughter Houses: Irish Sea Relations in the Twelfth Century’, (forthcoming, Lancaster, 2018), pp. 9-11. Birkett, The Saints’ Lives of Jocelin of Furness, pp. 141-143, 148-149,162-170: Flanagan, ‘Jocelin of Furness and the Cult of St. Patrick’, pp. 45-47, 65-66. W. Farrer &J. Brownbill (eds. ), ‘The Abbey of Furness’, <http://www.british-history.ac.uk/report.aspx?compid=38348>, accessed 27/03/2018. According to Constance Berman the Savigniac merger occurred in 1158, see C. Berman, The Cistercian Evolution: The Invention of a Religious Order in Twelfth-Century Europe (Philadelphia, 2000), pp. 142-148: For Holdsworh the date is 1147, see C. Holdsworth, ‘The Affiliation of Savigny’, in M. Dutton, D. M. LaCarte & P. Lockey (eds. ), Truth as Gift: Studies in Honor of John R. Sommerfeldt (Kalamazoo, 2004), pp. 45-48. Burton, ‘Furness, Savigny and the Cistercian World’, p. 13. John Stell, The Furness Abbey Coucher Book, Atkinson, J. C. & Brownbill, J. (eds. & trans. ), 3 vols. (Manchester, 1886-1887). John Stell, The Furness Abbey Coucher Book, Brownbill, J. (eds. & trans. ), 3 vols. (Manchester, 1915-1919). The British Library, London (BL): Additional Manuscripts, No. 33244: The Furness Abbey Coucher Book (Volume II). The National Archives, London (NA): Duchy of Lancaster: Deeds, Series L, 25/545, Rushen Abbey (Alan, Abbot) to Furness Abbey: Charter of Assent to the Election by Furness Abbey of Nicholas, Abbot of Rushen, to be Bishop of Man (1202-1213). The National Archives, London (NA): Duchy of Lancaster Miscellaneous Books, No.3: The Furness Abbey Coucher Book (Volume I). Abulafia, D., ‘Introduction: Seven Types of Ambiguity, c.1100-c.1500’, in Abulafia, D. & Berend, N. (eds. ), Medieval Frontiers: Concepts and Practices (Aldershot, 2002), pp.1-34. Babcock, R.S., ‘The Irish Sea Province and the Accession of Henry I’, in Fleming, D.F. & Pope, J.M. (eds. ), ‘Henry I and the Anglo-Norman World: Studies in Memory of C. Warren Hollister’, in The Haskins Society Journal, Special Volume 17 (Woodbridge, 2006), pp. 27-38. Barrow, G. W.S., ‘Frontier and Settlement: Which Influenced Which? England and Scotland, 1100-1300’, in Bartlett, R. & Mackay, A. (eds. ), Medieval Frontier Societies (Oxford, 1989), pp. 3-21. Barnes, F., Barrow and District (Barrow-in-Furness, 1968). Bartlett, R., The Making of Europe: Conquest, Colonization and Cultural Change, 950-1350 (London, 1993). Beck, T. A., Annales Furnesienses: History and Antiquities of the Abbey of Furness (London, 1844). Berman, C.H., The Cistercian Evolution: The Invention of a Religious Order in Twelfth-Century Europe (Philadelphia, 2000). Birkett, H., The Saints’ Lives of Jocelin of Furness: Hagiography, Patronage and Ecclesiastical Politics (Woodbridge, 2010). Burton, J., ‘Furness, Savigny and the Cistercian World’, in Downham, C. (ed. ), Jocelin of Furness: Essays from the 2011 Conference (Donington, 2013), pp. 7-16. Burton, J., ‘Dioceses, Saints’ Cults and Monasteries’, in Stringer, K.J., & Winchester, A.J.L. (eds. ), Northern England and Southern Scotland in the Central Middle Ages (Woodbridge, 2017), pp. 173-195. Burton, J. & Kerr, J., The Cistercians in the Middle Ages (Woodbridge, 2011). Carville, G., ‘The Cistercians and the Irish Sea Link’, Citeaux: Commentarii Cistercienses, 32 (1941), pp. 37-73. Clanchy, M. T., From Memory to Written Record: England, 1066-1307, (Oxford, 1993). Dade-Robertson, C., Furness Abbey: Romance, Scholarship and Culture (Lancaster, 2000). Dalton, P., ‘The Governmental Integration of the Far North’, in Appleby, J.C., & Dalton, P. (eds. ), Government, Religion and Society in Northern England, 1000-1700 (Stroud, 1997), pp. 14-26. Duffy, S., ‘The First Ulster Plantation: John de Courcy and the Men of Cumbria’, in Barry, T.B., Frame, R. & Simms, K. (eds. ), Colony and Frontier in Medieval Ireland: Essays Presented to J.F. Lydon (London, 1995), pp. 1-28. Edmonds, F., ‘The Furness Peninsula and the Irish Sea Region: Cultural Interaction from the Seventh Century to the Twelfth’, in Downham, C. (ed. ), Jocelin of Furness: Essays from the 2011 Conference (Donington, 2013), pp. 17-44. Edmonds, F., ‘The Emergence and Transformation of Medieval Cumbria’, The Scottish Historical Review, 93 (2014), pp. 195-216. Edmonds, F., ‘The Expansion of the Kingdom of Strathclyde’, <https://onlinelibrary.wiley.com/doi/pdf/10.1111/emed.12087>, accessed 27/03/2018. Edmonds, F., ‘Furness Abbey and daughter houses: Irish Sea relations in the twelfth century’, (forthcoming article, Lancaster, 2018), pp. 1-17. Ekwall, E., ‘The Place Names of Lancashire’, <https://archive.org/stream/placenamesoflanc00ekwauoft/placenamesoflanc00ekwauoft_djvu.txt>, accessed 30/04/2018. Farrer, W. & Brownbill, J. (eds. ), ‘Houses of Cistercian monks: The abbey of Furness’, <http://www.british-history.ac.uk/report.aspx?compid=38348>, accessed 27/03/2018. Farrer, W. & Curwen, J. F. (eds. ), ‘Records relating to the Barony of Kendale: Volume I’, <http://www.british-history.ac.uk/report.aspx?compid=49272>, accessed 27/03/2018. Fell, A., A Furness Manor: Pennington and its Church (Ulverston, 1929). Flanagan, M., ‘Jocelin of Furness and the Cult of St. Patrick in Twelfth-Century Ulster’, in Downham, C. (ed. ), Jocelin of Furness: Essays from the 2011 Conference (Donington, 2013), pp. 45-66. Ganshof, F.L., Feudalism (London, 1964). Gaythorpe, S.G., ‘Richard Esk’s Metrical Account of Furness Abbey’, Transactions of the Cumberland and Westmoreland Antiquarian and Archaeological Society, 53 (1953), p. 105. Geary, P., Phantoms of Remembrance: Memory and Oblivion at the End of the First Millennium (Princeton, 1994). Green, J., ‘Aristocratic Loyalties on the Northern Frontier of England, circa 1100-1174’, in Williams, D. (ed. ), England in the Twelfth Century: Proceedings of the 1988 Harlaxton Symposium (Woodbridge, 1990), pp.83-100. Hill, B. D., English Cistercian Monasteries and their Patrons in the Twelfth Century (Urbana, 1968). Holdsworth, C., ‘The Affiliation of Savigny’, in Dutton, M.L., La Corte, D.M. & Lockey, P. (eds. ), Truth as Gift: Studies in Medieval Cistercian History in Honor of John F. Sommerfeldt (Kalamazoo, 2004), pp. 43-88. Hudson, B., Viking Pirates and Christian Princes: Dynasty, Religion, and Empire in the North Atlantic (Oxford, 2005). Jamroziak, E., ‘How Rievaulx Abbey Remembered its Benefactors’, Jamroziak, E. & Burton, J.E. (eds.) Religious and Laity in Western Europe: Interaction, Negotiation and Power (Turnhout, 2006), pp. 63-76. Jamroziak, E., Survival and Success on Medieval Borders: Cistercian Houses in Medieval Scotland and Pomerania from the Twelfth to the Late Fourteenth Century (Turnhout, 2011). Kapelle, W. E., The Norman Conquest of the North: The Region and its Transformation, 1000-1135 (London, 1979). Kirby, D.P., ‘Strathclyde and Cumbria: a survey of historical developments to 1092’, Transactions of the Cumberland and Westmorland Antiquarian and Archaeological Society, 62 (1962), pp. 77-94. Knowles, D., The Monastic Order in England: A History of its Development from the Times of St. Dunstan to the Fourth Lateran Council, (Cambridge, 2nd Ed., 1963). Latimer, P., ‘Assimilation in North-Western England from the Norman Conquest to the Early Thirteenth Century: The Kirkby, Pennington and Copeland Families’, Northern History, 47 (2010), pp. 49-66. Leach, A., A History of Furness Abbey (Ulverston, 1987). Lekai, L.J., The Cistercians: Ideals and Reality (Kent, Ohio, 1977). Marshall, S., ‘Illegitimacy and Sanctity in the Twelfth-Century Lives of St.Kentigern’, in Downham C. (ed. ), Jocelin of Furness: Essays from the 2011 Conference (Donington, 2013), pp. 67-90. Milis, L. J.R., Angelic Monks and Earthly Men: Monasticism and its Meaning to Medieval Society (Woodbridge, 1992). Pollard, A. J., ‘The Characteristics of the Fifteenth-Century North’, in Appleby, J.C. & Dalton, P. (eds. ), Government, Religion and Society in Northern England, 1000-1700 (Stroud, 1997), pp. 117-130. Rigg, A.G., A History of Anglo-Latin Literature, 1066-1422 (Cambridge, 1992). Robinson, C., Between the Tides: The Perilous Beauty of Morecambe Bay (Ilkley, 2007). Scott, J.G., ‘The partition of a kingdom: Strathclyde, 1092-1153’, Transactions of the Dumfriesshire and Galloway Natural History and Antiquarian Society, 72 (1997), pp. 11-40. Smith, B., ‘The Frontiers of Church Reform in the British Isles, 1170-1230’, in Abulafia, D. & Berend, N. (eds. ), Medieval Frontiers: Concepts and Practices (Aldershot, 2002), pp. 239-254. Swietek, F. R. & Deneen, T., ‘” Et Inter Abbates de Majoribus Unus”: The Abbot of Savigny in the Cistercian Constitution, 1147-1243’, in in Dutton, M.L., La Corte, D.M. & Lockey, P. (eds. ), Truth as Gift: Studies in Medieval Cistercian History in Honor of John F. Sommerfeldt (Kalamazoo, 2004), pp. 89-118. ‘The Cistercians in Yorkshire’, <https://www.dhi.ac.uk/cistercians/cistercian_life/the_cistercians/britain/index.php>, accessed 30/04/2018. Turner, F.J., ‘The Significance of Frontier in American History’, in Turner, F.J. (ed. ), The Frontier in American History (New York, 1962), pp. 1-38. ‘Urswick 01, Lancashire, in “Vol.II: Cumberland, Westmorland and Lancashire-North-of-the-Sands”’, <http://www.ascorpus.ac.uk/catvol2.php?pageNum_urls=163>, accessed 30/04/2018. Walker, D., ‘The organization of material in medieval cartularies’ in Bullough, D. & Storey, R. L. (eds. ), The Study of Medieval Records. Essays in Honour of Kathleen Major (Oxford, 1972), pp. 132-50. West, T., The Antiquities of Furness: Illustrated with Engravings (Ulverston, 1818). Wood, J, ‘Furness Abbey: A Case Study in Monastic Secularization’, in Kinder, T.N. (ed. ), Perspectives for an Architecture of Solitude: Essays on Cistercians, Art and Architecture in honour of Peter Fergusson (Turnhout, 2004), pp. 377-385. Young, A., ‘The North and Anglo-Scottish Relations in the Thirteenth Century’, in Appleby, J.C. & Dalton, P. (eds. ), Government, Religion and Society in Northern England, 1000-1700 (Stroud, 1997), pp. 77-89.